5. These cat tights are so cute! It looks like the shop is currently closed but they are just so neat I had to share them. Thanks again to my friend D. for sending me the link! 4. These chargers look so pretty. The colours are so pretty together. I have never used chargers (because I don't throw fancy dinner parties) but maybe I should start! 3. Maybe I should use chargers to serve these fancy cake batter pancakes. Well, a vegan version of them. They are so colourful! 2. I loooove these shoes. 1. I don't know the original source of this (sorry!!) but it was way too cool not to share. I wish I had a fan to do this with!! I am feeling a lot better today! Ivan finished painting the baby room last night so now I can start thinking about the things I want to put in it to decorate. I will show you the progress eventually (when it looks like something other than an empty room). I love the tights ! and actually all things in this post ! :) hope you're having a great day ! Sending love from Slovakia !!! Those tights are so cute! I've seen plenty of cat tights, but I think the tails on the back are a great touch. Those pancakes are so pretty (though I feel like I'd get sick after eating them...), and I was eyeing those shoes in the tan color! Awww, kitty tights! I love that they added the tails on the back too. 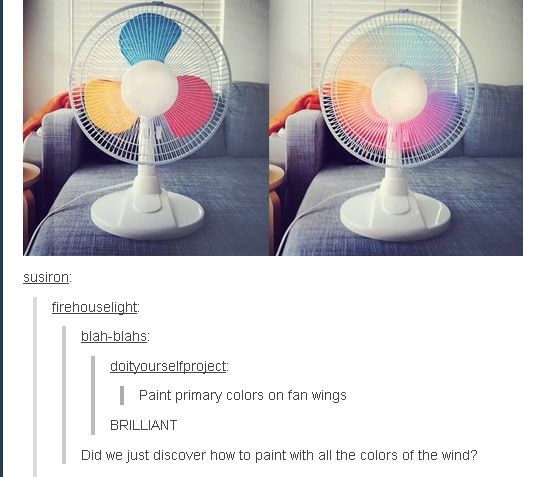 That color wheel fan is pretty amazing, as well! That fan picture is definitely Tumblr, lol. I want those shoes! The fan idea is cool, and I wish they had a dog version of those cat tights :) OR squirrel!!!! Those tights are cute, but what I really like is that awesome dress with them. I love the fan! It cheers you up! The fan looks so cute! I love it. That fan is so awesome!